I just wanted to share a cute birthday card I made today. Click on the picture for a larger view. I just love the colors and the glitzy paper. The stamp is a clear one from the $1 bin at JoAnn’s. And, of course, I had to add the stitching border that I’m obsessed with lately! What do you think? And what does it inspire you to create? Click on the photo for details. I keep a bunch of folded card stock for when I need a card at the last minute, and found a piece of purple. Then I went to my stash of scraps and found some printed paper that was already the right width (about 3 inches) left over from a previous project that was long enough, and trimmed it and glued it to the purple card stock. 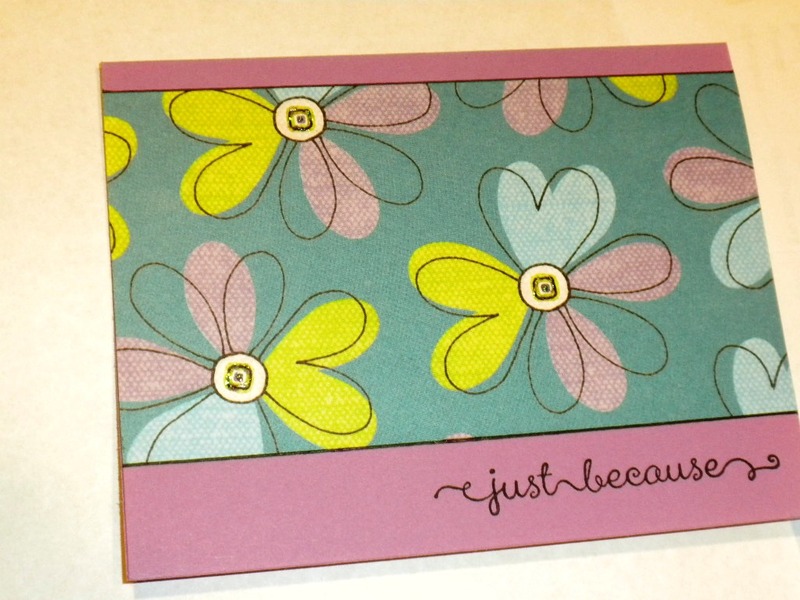 The best part was that design in the printed paper coordinated wonderfully with the “just because” from the stamp set “A Dozen Thoughts.” So I stamped it on the lower right hand side, and the card was done!!! Well… execpt for adding some Stickles glitter glue to the centers of the flowers. Click on the photo to see all the detail. I just wanted to share this cute card I made a few days ago using the Stampin’ Up! set “Happy Day” (pg. 112 in the catalog), and the new Bermuda Bay Ink. I just love the intricate detail in the centers of the medallions. 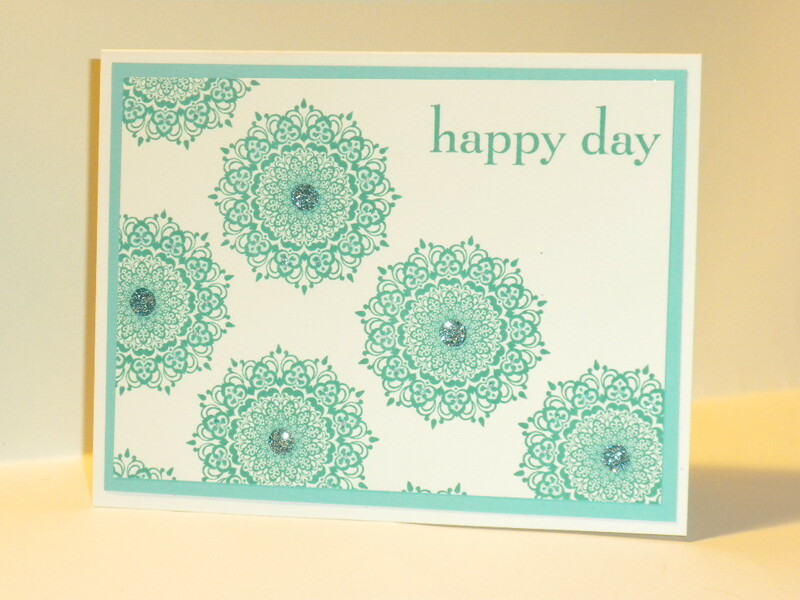 Stampin’ Up!’s new foam ink pads really give awesome coverage! The set also comes with “hello there,” “smile,” and “sweet, sweet moments,” so it’s really a very versatile stamp set. The sparkly bling in the centers of the medallions is a 1/2″ circle punch of SU’s Silver Glimmer Paper — colored with a turquoise permanent marker. Worked awesome! The “Happy Day” clear mount set is only $16.95, and the wood mount is $21.95. 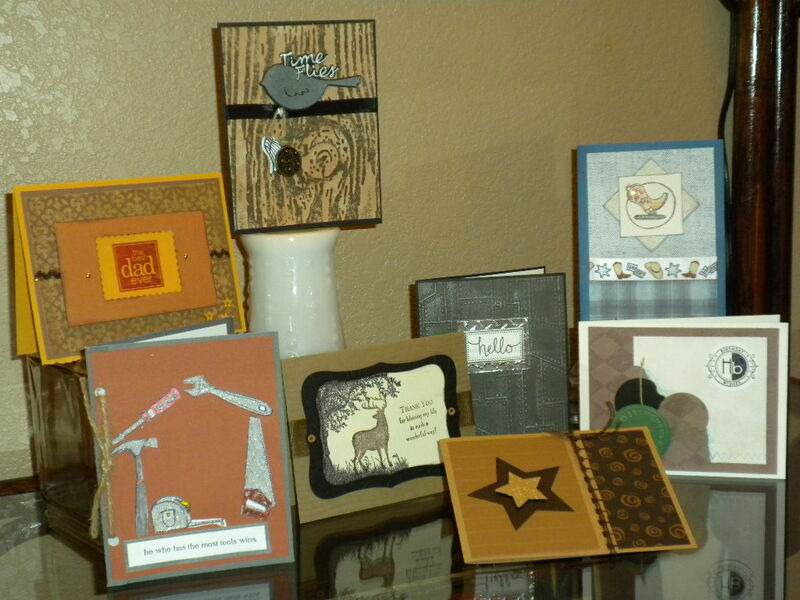 To see this set and more, shop on-line on my Stampin’ Up! website. Happy stamping! Man, did I ever struggle with last month’s project challenge (pun intended)! In honor of Father’s Day in June, we decided to try to come up with cards appropriate for guys/men/boys. For me, it wasn’t as easy as I thought it would be. Fortunately, the Scrapbook Mega Meet was a couple of weeks before our get together, and I found an awesome grungy embossing folder (by Tim Holtz) that looks like riveted steel plates. I used it on dark gray card stock, then applied metallic rub-ons to make it look more aged and distressed. (My card is in the middle of the group with “hello” on it.) I also used silver duct-work tape, which after sticking it down onto plain card stock and embossing it, looked alot like diamond-plate aluminum (which ALL guys love). The card turned out pretty awesome, as did the ones from the rest of the team. If you click on the photo, you’ll see an enlarged version. The cards featured tools, deer, cowboy boots, charms, embossing folders, crimping, stars, a cool ink technique, some glitz, and some twine. The twine led to part of our challenge for June… Bugs (for June Bugs) and twine. I’m anxious to see what the team does with THAT combination. Whatever it is, you’ll see it here first! I’m truly sorry that it’s been so long since I’ve added something new…and I can’t even say that “no news is good news.” I was just lazy. I’ll try to do better from now on. 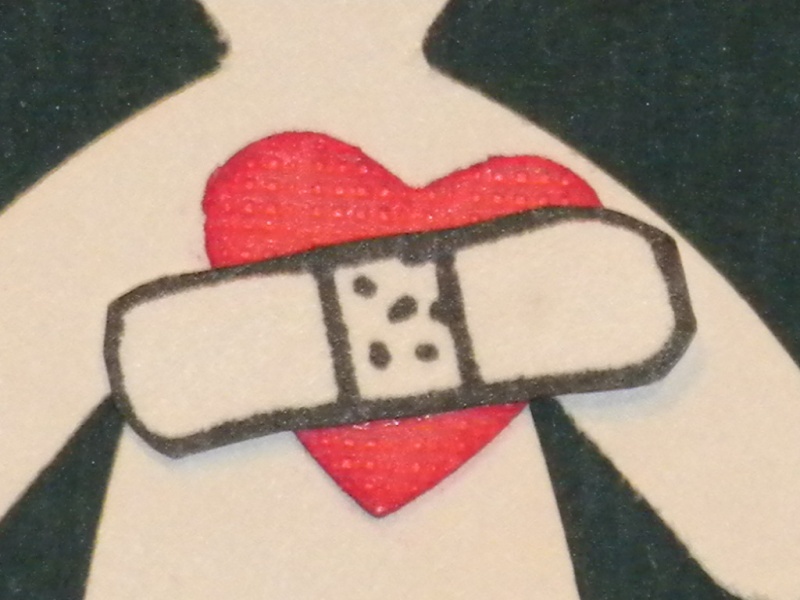 The SWAT Team meets again on April 20th, and our challenge for the night is to use band-aids (real band-aids or a stamp) somehow in making a get well card or gift. Here’s a sneak peak of what I came up with. Any member of the group who comments on this post, and comes that night, will get two Stampin’ Up! stamps! Just click on “Leave a Comment” right below this post and leave me a note. Even if it’s just to say… “I’m coming on the 20th.” Hope to see you then! And… hope you all have a blessed Easter!